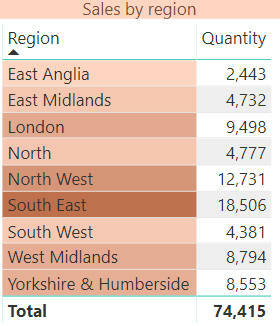 The darker the region, the higher the sales for it (this table colours the region's name according to the value of a different field: the total quantity sold). To get this to work, it's important to first select the field you want to format, and not the field whose values determine the formatting to use - as I've just discovered! Click on the drop arrow in the field well next to the field whose appearance will change (in this case, the region field). 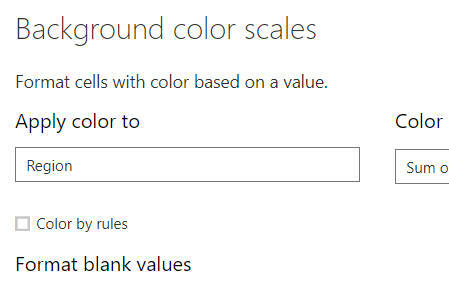 Select to change either the background or foreground colour. Here we're applying colours to the Region field. On the right-hand side of the same dialog box, choose the field whose value should determine the colours to use, and which function you want for it (summing, counting, averaging, etc). 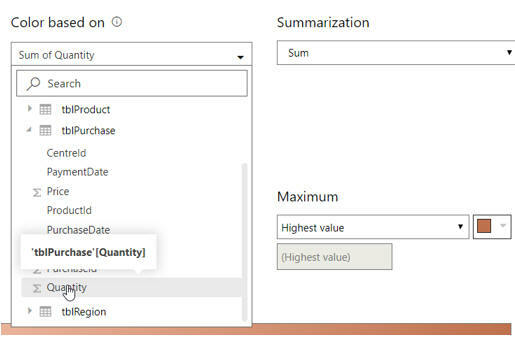 The rest of conditional formatting is unchanged.